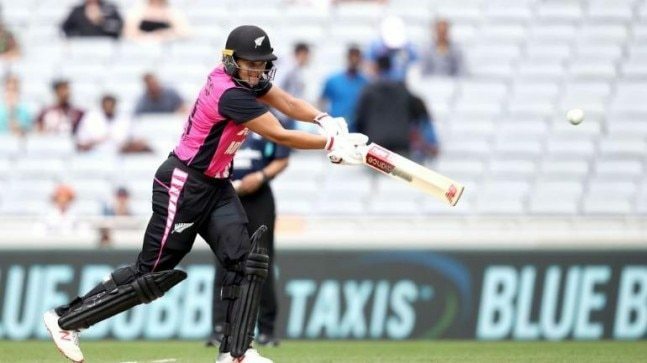 Suzie Bates scored a brilliant 62 as New Zealand Women won a last ball thriller to seal the T20 series against India at Auckland on Friday. After being sent into bat by Amy Satterthwaite, the visitors started badly as they lost opener Priya Punia cheaply in the third over for 4. Smriti Mandhana and Jemimah Rodrigues added 63 runs for the second wicket stand, before the former was caught by Bates off Rosemary Mair for a quickfire 36. Skipper Harmanpreet Kaur didn’t last long and perished after making just 5 runs. Deepti Sharma along with Rodrigues stabilized the innings by adding 22 runs for the fourth wicket, before the former was brilliantly run out by Katey Martin. The 18 year old Rodrigues registered her fifth T20 fifty but failed to get support from her other team mates. Apart from Mandhana and her, none of the other batswomen were even able to get to double figures- a performance not too dissimilar to what happened in the first T20 in Wellington. The teenager was eventually stumped in the penultimate over by Martin off leg-spinner Amelia Kerr for a fantastic 53 ball 72. Her knock comprised of six boundaries and one six. The Indian women finished with a modest score of 135 for 6 in their allotted 20 overs. Given India’s reluctance to play Mithali Raj and their heavy dependence on Mandhana, Rodrigues and Kaur, we had predicted a White Ferns victory on Nostragamus. That came true, but the Kiwis didn’t have it all their own, only managing to clinch victory on the final ball. Rosemary Mair was New Zealand’s best bowler as she ended up with 2/17 in 4 overs, while Sophie Devine, Amelia Kerr and Leigh Kasperek claimed a wicket each. Chasing a target of 135 runs, the White Ferns lost Sophie Devine and Caitlin Gurrey cheaply within the first seven overs as India reduced them to 40/2. However the 31 year old Bates and Satterthwaite stitched a 61 run stand for the third wicket to get the hosts back on track. Poonam Yadav provided the vital breakthrough by getting Sattherthwaite for a well made 23. Radha Yadav and medium pacer Arundhati Reddy bowled tightly in the middle overs to take the match right down to the wire. Reddy brought India women back into the match in the 18th over, dismissing Bates and then Anna Peterson for a first ball duck to bring them back into the contest. With 9 runs requiring off the last over, Katey Martin smashed Mansi Joshi for a boundary off the first ball to bring down the equation to a run a ball. However Joshi got Martin on the very next delivery, leading to some nervous faces in the Kiwi camp. They eventually scampered home on the final ball, with Hannah Rowe scoring the winning run. Suzie Bates was declared the Man of the match for her brilliant performance with the bat. New Zealand women lead the three match series 2-0. The final T-20 international will be played at Hamilton on 10 February.